...as you will see the final made up design pretty much resembles the my first sketch. This happens like...never! Wear her in 2 ways - Her straps adjust, so you can wear her 2 ways, either on the shoulder or across the body to keep your hands free. She's most definitely a bag (not a purse) - She will fit your keys, phone, money, water bottle, Kindle, make up bag and a small umbrella! She has a roomy front pocket with a cute tab closure - For inner organisation she has a roomy lining pocket. She has structure - her pretty purse frame is nicely contrasted with a squared and firm base. She has versatile looks - make her in solid + pattern fabrics (like I have) or make her in all solids, all pattern or have some real fun by combining textures. 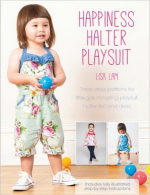 The design is perfect for fabric playfulness! She is easy to make - you can make the purse in a day and be ready to take her out in the evening. 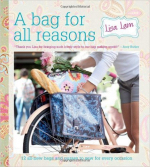 A Bag Making Kit as well as a PDF Pattern or Hard Copy Pattern. Her straps adjust so you can hold her as a hand/shoulder bag and for hands-free you can wear her cross-body. I hope you like the new bag as much as we do, the only thing left to do now, is to give her a name. CAN YOU HELP? The lucky winner will WIN this new BLANK bag making kit, which will contain all you need to make the purse, except fabrics, threads and glue. * Picking a name for the bag design. A couple of pointers to help you: We tend NOT to name purses/bags after girls names (such as 'Jane Purse' because IMHO that has little meaning...), and instead tend to lean towards names which describe the purse or bag in some way. * Please DO NOT focus on the fabric of this bag as the pattern and kit do not come with fabrics. Ta! * You can enter as many times as you wish to. * We will select the winning name at the end of Friday 2nd Feb 2018 (GMT) and announce the winner the following day. * We will need to ask the winner to make a donation for the postage (the kit will be sent as soon as the pattern is published). * Prizes which are not claimed within 3 weeks of the winners announcement will be carried forward to the next draw. * Sorry we are unable to reply to contest/draw comments, but we do love reading every single one. 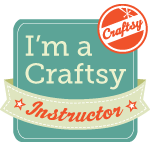 Give it a go and see just how much more fun you can have with your creations, giving them more zing, pop and whizz. Don’t be shy, remember to share your creations with us, we can’t wait to see what you come up with! A mighty THANK YOU goes out to all the amazing crafters who took part in the @uhandbag #lovebagsmakebags instagram challenge. We've really loved peeking into your bag-making world and seeing how and where you make your creations, and we've been blown away by what a talented bunch you are! Congratulations Stitchedbystarlight; please step forward and contact us to claim your prize! I've always had a special fondness for this bag design. It was such a puzzle to figure out how to construct it, but when I did I felt like a bit of a magician (and when you make it you will too!). Back when the pattern was first published, interlining and wadding choices were limited. Nowadays there are all sorts of technically advanced support options at our disposal. Fast forward to 2017 and I've decided that The Trinity Bag deserves a loving update. I have rewritten the pattern to include squishy fusible foam (I promise not a wrinkle will be seen on the outside), I've added a mag snap to the central compartment (very pleasing and more secure) and used our 30" leather piped handles (looks totes fab!). For the first time The Trinity Bag is available as a kit as well as a pattern, for those of you who have yet to be introduced to her, let me do so now. With her 3 compartments she makes for easier organisation and rummaging. She looks neat, but she can expand to hold more, as needed. You can store your larger possessions in the roomy front and back compartments and your smaller essentials in the middle compartment. The handy thing about this bag is that you can access all 3 compartments via one flap (which means, no having to pop open or unzip squillions of pockets to get at what you need). The bag is secure thanks to it's posh-looking tongue lock and thanks to the placement of the bag handles (that rest upon the flap itself) there's even less access for naughty fingers! You might be thinking, "if Lisa had a 'whale of time' figuring out this design, then won't it be a 'nightmare' for me to make??" I can assure you, I have figured out all of the hard stuff and made it easy for you, so that this bag is no harder to make than any of my usual designs. I have included almost 30 pics with this pattern and none of the steps are hard or exotic. Honest! She feels and looks the business - the new padding not only feels substantial, it really makes the bag look professional and high quality. She's secure - the tongue lock is effective and looks fab. The bag handles stand up over the bag flap and this further increases security. The snap in the inner pocket will ensure your possessions won't escape whilst you're running for the bus. She looks so professional - we think she has 'It Girl' looks! She's versatile - she's primarily meant to be held by her leather handles, but should you need your hands free you can slip on the shoulder strap. She's not nearly as hard to make as you might think - I promise. She's roomy and organised - for her neat dimensions she can hold a fair amount! Organise your possessions in her 3 compartments and enjoy calm rummaging. Take The U-Handbag Instagram Challenge! We are soooooo in love with Instagram here at U-Handbag. It’s fab for telling little visual stories and sharing lots of pretty photos, plus it’s full of GORGEOUS accounts jam-packed with tasty eye-candy to swoon over. Our challenge will start on Monday 20th November and run for seven days. Each day will have a different theme to inspire you, and we’ve listed them below to give you a head start on thinking about all the lovely pics you might share. All you need to do is post your image on the appropriate day and tag it with our special challenge hashtag #lovebagsmakebags (so we can find it!) and add the day's prompt too (ie #baglady, #spacetosew etc). You can also tag us - @uhandbag - and any people that you think might like to join in too (we don’t mind if they start halfway through – the more the merrier!). We’ll be sharing our favourites from each day as the week goes on and then at the end we’ll pick our ultimate favourite image and that lucky person will win £50* to spend at U-Handbag. Honestly, we can’t wait. Are you going to join us? We hope you can! Need a bit of insta-spiration? Monday 20th November: FLASH YOUR STASH! We just KNOW you have a big old stash of bag-making goodies. Is it fabric? A fabulous sewing kit full of gorgeous things? Or is it a collection of the bags you have made, or other bags and purses you have collected over the years? Whatever it is, we want you to FLASH IT. This might be a simple selfie, or maybe a bag-loving friend decked out in your creations, or even you in the process of making. We want to meet you (and your bags). Wednesday 22nd NOVEMBER: MY FAVOURITE …. What’s your favourite THING? Is it a bag you’re reeeeealllllly proud of? A useful sewing tool or gadget you can’t live without? A gorgeous piece of fabric? A colour you love? Something that inspires you? Your partner? Your cat? Basically, we need to know. We'd love to see your really personal, special makes. Maybe it’s something you created from your own pattern, or something you made using something you love, or something unusual or recycled – like crazy faux-fur fabric or an old pair of jeans, for example. We want to take a peek into your sewing room, see your sewing table or even a favourite corner of the sofa where you like to sew. Or is it more of a state of mind? How do you feel or want to feel when you’re making? We don’t care how messy it is, we’re just really, really nosey. SATURDAY 25th November: WHAT’S IN YOUR BAG? So what IS in your bag? Our handbags tend to resemble Dr Who's Tardis – superficially small on the outside and yet completely full of a surprisingly large amount of stuff on the inside. 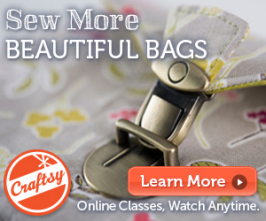 Maybe it’s your sewing bag? Or your make-up bag? If you’re a keen Instagrammer, this is a chance for some super-stylish flat-lay shots. There are lots of ideas on this Flickr account too. This is a chance to show off your bags in action. What’s your favourite bag/outfit combo? Maybe you have a gorgeous party bag or colourful beach tote that doesn’t get much of a workout in everyday life. How do you style your bags? Do you match them to what you’re wearing? (if you do, we salute you) or maybe it’s a real old favourite that goes everywhere and does everything (like that Tardis). Need a bit more inspiration? Here are a few of the accounts we love. And if you have any other favourite accounts you like to follow, let us know! Thank you to everyone who entered the competition to name the new purse kit. The winning name is: ‘My Little Pumpkin', which is extremely apt for this time of year, and it was suggested by Jeanette. Congratulations Jeanette; please step forward and contact us to claim your prize! Love your curves with this new purse design. This purse has gorgeous shapely curves and is a bit flirty, even better you can make her in 2 sizes, so you'll have double the fun! She's perfect for parties, weddings, cruises and nights out on the town. She looks fab in your fave print fabrics, and she also looks knockout in a solid colour topped off with a sparkly decoration. Make this purse for the party season and you'll have a gorgeous plus one to accompany you to the party! * Make her in 2 sizes (that both work on the same purse frame). The small size is neat and dainty and the larger is a roomy, rounded, good time girl! * She has versatile looks - make her in prints or solids (and embellish with a pretty decoration, instructions are included). * She has flirty - her yummy roomy rounded shape is so voluptuous! * She is easy to make - you can make the purse in a day and be ready to take her out in the evening . A Purse Making Kit as well as a PDF Pattern or Hard Copy Pattern. This purse comes in 2 sizes and as you can see, both sizes work on the same purse frame (hooray). The small size is perfect for your minimum essentials including smaller smartphone. The larger size is bigger in every way, surprisingly roomy, it will comfortably fit the larger sized smartphones and more and I confess the larger size is my favourite (she just looks a bit naughty!). Perfect with a pretty chain. A nice wide base gives this purse va va - room! For an attention-stealing effect try attaching a sparkly decoration to the front (like this bouquet of pearly leaves and flowers) of the purse. I've included full instructions on how to attach a decoration like the one below. I hope you like the new purse as much as we do, the only thing left to do now, is to give her a name. CAN YOU HELP? The lucky winner will WIN this new BLANK purse making kit, which will contain all you need to make the purse, except fabrics, threads and glue. * Picking a name for the purse design. A couple of pointers to help you: We tend NOT to name purses/bags after girls names (such as 'Jane Purse' because IMHO that has little meaning...), and instead tend to lean towards names which describe the purse or bag in some way. * We will select the winning name at the end of Tues 24th Oct 2017 (GMT) and announce the winner the following day. We have had more than a few questions about which interfacing should be used for crocheted/knitted bags or even old jumpers which have been up-cycled into bags. So below is our first Bag Doctor on call and with The Knitting and Stitching Show this coming 11 to 15th October 2017, we hope these helpful hints and tips will give you some inspiration for the show to come. When making a bag from a woollen/knitted product we recommend that you first make an inner bag that you will attach to the top opening of your knitted bag. This will help in several ways. It will stop the wool/yarn from stretching and becoming misshapen and it will make it easier to attach closures (such as zips or magnetic snaps) to the inner bag. We also suggest that if you are using a more open (holey) knit, you double the inner bag and turn it inside out, which will ensure that the interfacing and seams are hidden within the inner bag. * If you are using a wooden frame or handle you can knit around the frame, which will give stability to the top of your bag. We can also recommend using flexi-tube to get a similar effect, which, if you are knitting the bag from scratch, you can also hide within a knitted handle. This will give your handle strength and stop gravity from pulling it out of shape. * Pre-made handles are another quick, easy, decorative alternative to make your woollen creations look great. Again, we recommend attaching these to either the top of the inner bag or use sew on handles and stitch through the wool and the lining (if you are using Decovil or similar). * Webbing or strapping handles with or without adjustable straps can easily be attached to the inner bag and make for a very smart and polished look, see our Make Your Own Handles collection for everything you will need for this. * Decovil Fusible is great for stability and a more rigid stand-alone structure. Fuse it directly onto close weave knits and it would also be great to use with sew-on pre-made handles. * Thermolam Plus Fusible or sew-in Thermolam both have a felt-like feel to them, and they give a soft, thicker, spongy, padded feel with medium support. * Medium Loft 640 Fusible gives a squishy feel with a similar support to the Thermolams, but not quite as thick, making it ideal for use with sew-on frames. Great for an evening clutch with finer yarns for that extra special luxurious look. * 2VG700-10 Woven White Iron On is a much less bulky alternative to Medium Loft, again for use with finer yarns and it won’t disturb the drape of your bag. Please read the individual interfacing/lining product descriptions to better understand what each of them will achieve or read Lisa’s blog on interfacing here to get an in-depth guide on the all interfacings we sell. ...Do you have a troublesome bag-making ailment? Is there something you struggle to get right, a technique that confounds you or something you just don’t know how to tackle? 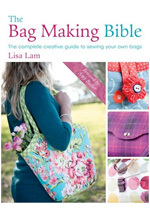 Well, Lisa is re-opening her Bag-Making Clinic especially for you! In a series of blog-posts, she and the team will tackle your popular bag-related aches and pains with some advice to help you on the road to recovery. To get the clinic well and truly on its way, we need you to pop yourself on the couch and tell us all about it. Simply click on the image above or here to take you to our BAG DOCTOR reply page alternatively you can comment under the relevant posts on our Facebook and Instagram pages - look out for the cunning bag-making stethoscope image above ;). We look forward to hearing from you! So you’ve made your fabulous handbag and now you want to show the world, right? Here at U-Handbag we LOVE LOVE LOVE seeing your beautiful creations and we are always blown away by what a talented lot you are! We really enjoy featuring your inspiring creations on Instagram and our Customer Gallery page so we thought we’d give you some simple tips on how to make your photos look as professional as your bag. First up, you really don’t need a fancy-shmancy camera or equipment to take a great photo. A smartphone camera is absolutely fine, as is a basic point-and-shoot camera. It’s definitely what you do with it that counts! It goes without saying that your bag should be the star of the show, so make sure that it is in focus (it sounds really obvious, but sometimes automatic cameras like to focus on other things in the frame). This is usually easiest to achieve by putting your bag at the centre of the image. Once you’ve lined up your shot, press the screen on the smartphone or squeeze the camera shutter very gently to get the focus square lined up on the bag so it’s nice and sharp before you go ahead and click. Do you need to photograph the bag head-on? Play around with moving the camera to one side or up or down, as sometimes a photographing at a slight angle can really highlight important features of your bag such as the shape, straps, handles and other details. Can you show the bag in action or get a willing friend or family member to model it for you? When you are composing your image, don’t just look at the bag, have a good look at the background as well. Is there something that makes the image look weird (think of the old tree-growing-out-of-the-head comedy photos!) or is the bag sitting halfway down the frame and looking cramped and sorry for itself? It’s really worth taking a few moments to ensure that your bag is indeed ready for its close-up! If your background is too busy, it can make your bag really hard to see properly. Try and find a nice unfussy background that doesn’t compete with your bag and really makes it stand out. It can be either dark or light – it depends on the colour of your bag. White is very tricky to work with as, unless you have access to photo-editing software, it often turns out looking grey. A patterned background may work if your bag is very plain, but it’s probably best to err on the side of caution. Experiment with chairs, wooden tables, doors, painted walls, fabrics or even dense foliage as possible backgrounds. If there’s one thing you should avoid at all costs, it’s using a flash. It creates odd lights and shadows and will honestly do your beautiful bag no favours at all. Use bright, natural light in a well-lit spot in your home, or even outside in the garden. Direct sunlight is also best avoided as it creates harsh shadows so, oddly, overcast days are quite good for taking photos. PROFESSIONAL TIP: If you are photographing by a window where the light is coming from one side, create a more even light on your bag by holding or propping up a ‘reflector’ on the opposite side. This could be a sheet of white card or paper, a large piece of tin-foil (dull side up) or even a mirror covered in tracing paper if you don’t want to invest in a proper photographic one (although if you do, there are lots of great inexpensive options available online – try Amazon). The reflector will bounce light back onto the bag and help to get rid of those nasty dark shadows. We really hope this has been helpful and we can’t wait to see all your gorgeous bag photos. We will be updating the look of our Customer Gallery soon and getting stuck in to Instagram again, so the better and brighter your shots, the more likely we are to feature them! Available worldwide (including my shop). A List of My Essential Bag Making Equipment. Good day in the office dear? 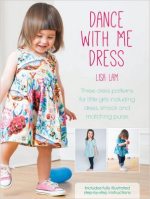 Lisa doesn't just sew bags! Introducing WASHABLE PAPER - your new favourite fabric! Contemporary Wedding Minaudière Clutches: inspiration and easy tutorials. Boho Wedding Minaudiere Clutches: inspiration and easy tutorials. Vintage Wedding Minaudiere Clutches: inspiration and easy tutorials. Kate on Boho Wedding Minaudiere Clutches: inspiration and easy tutorials. A list of most enjoyable blogs!